More fall birds have visited our yard with more soon to follow. Fall warblers, like the Magnolia, Yellow Rumped and Wilsons, are starting to arrive. In the spring warblers with their bright plumage are quite easy to identify, but in the fall with their drab winter plumages identification is quite difficult. All are brownish with varying degrees of yellow. Here, one has to be familiar with subtle field marks. Another helpful tool is distribution. 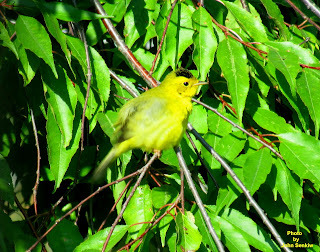 For example, Yellow Warblers are gone for the year, therefore, any yellowish warbler has to be something else. Two such warblers are the Magnolia and the Wilsons. Both are yellow but the Magnolia has a yellow rump while the Wilsons has a black cap. This is the time of year to test one's birding skills. With the fall game bird hunting season underway I started to focus on a game bird, in particular, the Sandhill Crane. While planning the article I remembered something that happened about forty years ago. It was the time when the crane season had just opened for the first time and bird hunters were eager to try their hand at crane hunting. Because of their lack of knowledge of birds some hunters shot a similar bird, the Great Blue Heron, by mistake. Being an illegal act everybody kept quiet about it. The goose sized Great Blue Heron is grey with long legs and neck giving it an overall length of almost four feet - one of our largest birds. The easiest way to distinguish a heron from a crane is when the bird is in flight. A heron flies with its neck coiled back so that the back of its head rests on its shoulders; a crane flies with its neck stretched straight out. Another characteristic is that cranes often feed on grain in fields; herons never do. Sandhill Cranes are social birds usually seen in flocks; herons are solitary. During breeding season the reverse is true. Cranes nest in isolated pairs; herons nest in large colonies called rookeries. 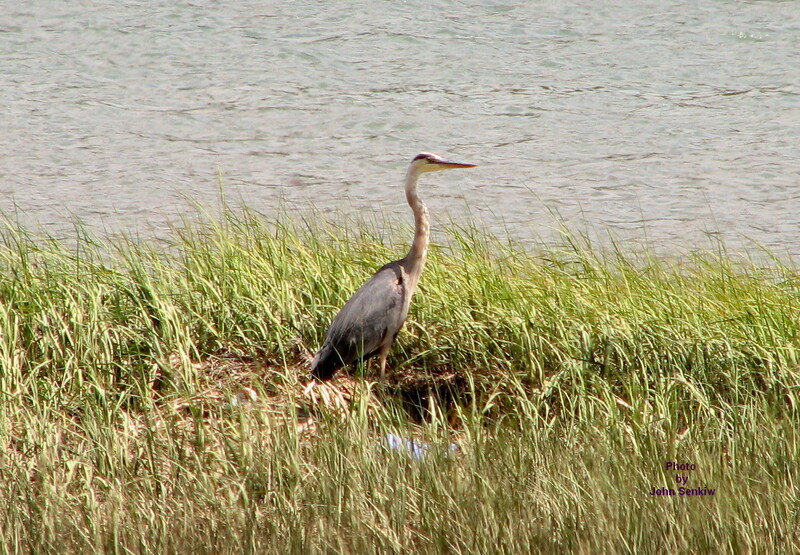 Cranes nest on the ground in marshes; herons nest high in mature trees. The one and only rookery that I ever saw was one at Marean Lake near Greenwater Lake. Unfortunately, human development caused the herons to abandon the site. The good news is that both cranes and herons are plentiful. The Great Blue Heron does not eat plant food but feeds entirely on fish and other water creatures. It does so by standing motionless in shallow water waiting for something to swim by at which point it strikes with amazing speed to grab the luckless creature. Because of its feeding habits it is usually found in quiet waters of larger sloughs and lakes. It is actually quite easy to distinguish the Great Blue Heron from the similar Sandhill Crane. 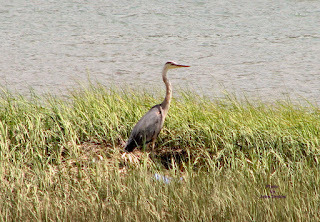 Both are grey but the Sandhill has a bright red bald patch on its forehead; the Great Blue Heron has a white crown with a black eyebrow line that extends backward into a long plume. It reminds me of a bald headed man sporting a pony tail. Males and females are the same. This week's photo of the Great Blue Heron was taken several years ago in Carlsbad, CA at the Batiquitos Lagoon. 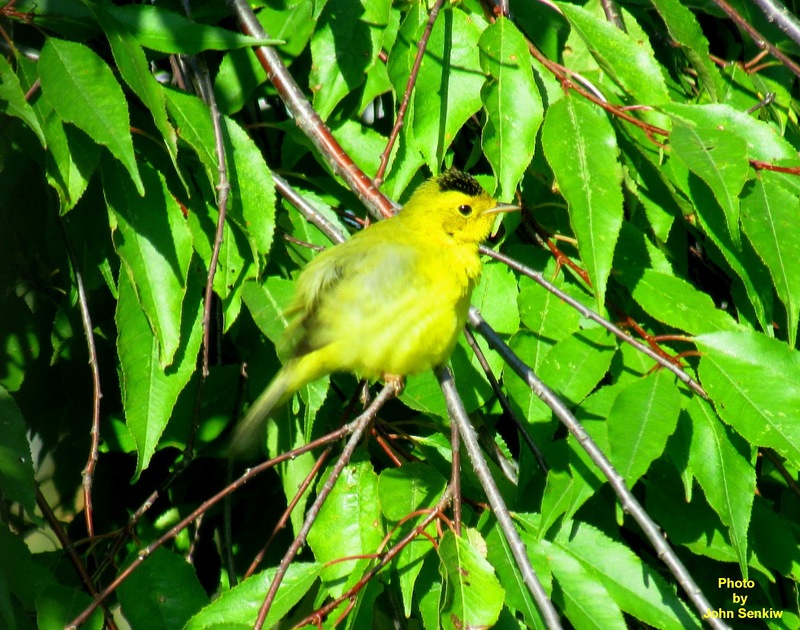 The Wilsons Warbler was taken in our backyard this past week as it was preening in the morning sun. The sharpness of the photo of the warbler is not that good as it was in a continual state of motion during its preening, but the black crown patch is clearly visible.